I would like to take this opportunity to express my gratitude for your participation in the First World Tour Exhibition of Contemporary Art in London. This international exhibition featured 40 artists from 24 countries and attracted during the Vernissage opening reception visitors from all around the world, among them, collectors, gallery owners, curators, artists and critics. I appreciate your effort to participate in this diverse exhibition and I congratulate you for the caliber of work shown to represent your respective country. 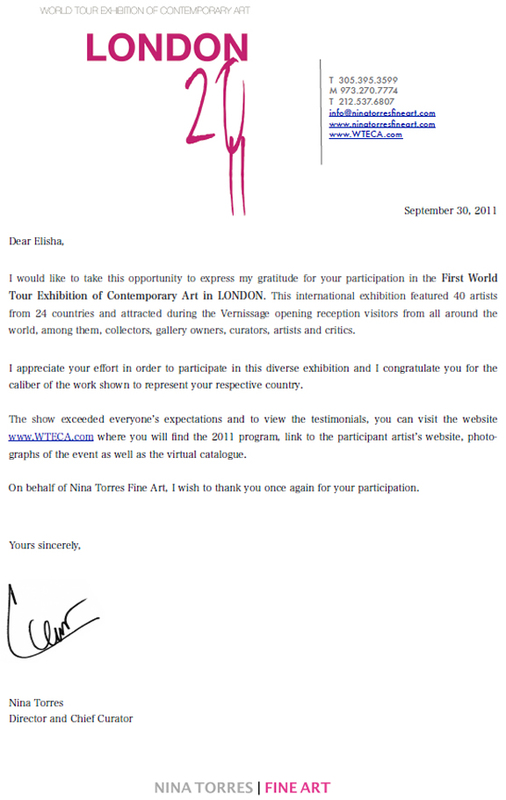 On behalf of Nina Torres Fine Art, I wish to thank you once again for your participation.